The slim and beautiful English Setter was originally bred for its hunting ability and not its beauty. The English Setter's coat lies straight and smooth over its back, fringing along its underside and the back of its legs. English Setters originated in England. Male English Setters range from 24 to 27 inches (61 to 69cm). Female English Setters range from 23 to 26 inches. Male English Setters range from 55 to 80 pounds (25 to 36kg). Female English Setters range from 45 to 0 pounds (20 to 32kg). 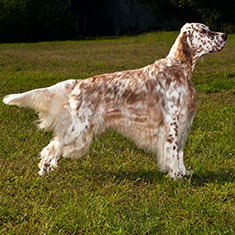 English Setter color combinations include: black & white, white & orange, white & lemon, white & chestnut or tricolor. Speckling may be present. 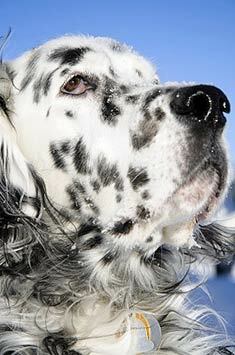 The English Setter's coat requires regular brushing in order to maintain its silky sheen. This breed is an average shedder and should be checked for burrs and tangles that can embed themselves in their fur. English Setters are extremely devoted and love nothing more than to be part of their families. They are sweet, gentle and placid and love to play, jump, run and dig. English Setters get along with children and love to play with other dogs. This breed can be a barker, a habit which should be discouraged at an early age. Female English Setters are prone to false pregnancies. This breed is prone to hip dysplasia and should also not be overfed because they gain weight easily. English Setters have a life expectancy of 10-12 years. English Setters require lots of exercise to match their stamina and active personalities. They are inactive indoors and require a yard to play in. English setters require daily exercise to be happy and healthy. The English Setter is in the Sporting Group. Find English Setter Puppies with our Free Breeder search!